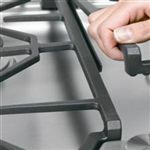 Get the utmost control over your cooking thanks to this innovative and versatile gas rangetop with griddle. 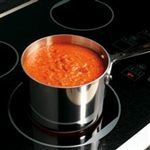 The reason professional chefs across the globe prefer gas cooking is simple: It gives the cook the most control. This unit features 6 sealed burners, capable of both searing steaks and simmering delicate sauces. 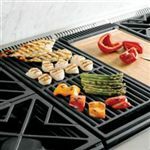 The unit also features a grill, which allows you to enjoy the delicious flavors of the grill during all months of the year from the comfort of your kitchen. 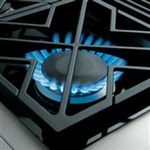 The burner grates are continuous to make pan transfer and movement easy, and the grates are even reversible so they can accommodate both flat and round-bottomed cookware. Aesthetically, the unit is graceful and elegant, featuring a stainless steel exterior with smooth edges, heavy-duty handles, and large electronic control knobs. The Rangetops and Cooktops 48" Professional Built-In Natural Gas Rangetop with 6 Burners and Grill by GE Monogram at Jordan's Home Furnishings in the New Minas, Halifax, and Canning, Nova Scotia area. Product availability may vary. Contact us for the most current availability on this product. Enjoy the versatility, innovation, and high-performance found in GE Monogram®'s line of cooktops and rangetops. 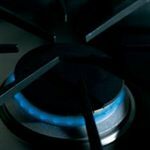 With options for gas, electric, or induction heating elements, you have the option of choosing the best style for your needs. All products in the line are attractive and fit in seamlessly with your design plans, enhancing and accentuating the gracefulness of your kitchen. The Rangetops and Cooktops collection is a great option if you are looking for Appliances in the New Minas, Halifax, and Canning, Nova Scotia area. 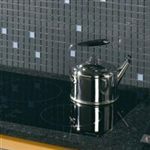 Browse other items in the Rangetops and Cooktops collection from Jordan's Home Furnishings in the New Minas, Halifax, and Canning, Nova Scotia area.